In recent years LCoS projectors have been growing in popularity and have slowly become more and more affordable. If you are new to projectors, you may be asking yourself: Is this the right type of projector for me? How does this compare to LCD vs DLP? What is with all of the acronyms? At first glance LCoS may seem like a complicated topic, but our experts have broken down exactly what you need to know. LCoS stands for Liquid Crystal Technology on Silicon. It is a hybrid between DLP and LCD. DLP projectors use tilting mirrors to reflect light either into or away from the lens while LCD projectors use liquid crystals on glass panels that modulates the amount of light that passes through. LCoS projectors combine the reflective technology of DLP but blocks light using crystals, similar to LCD. This results in an ability to produce whiter whites and deeper blacks. LCoS is a three-chip technology that controls light within the primary blue, green, and red channels. This means that an LCoS projector can deliver colors simultaneously rather than using a spinning color wheel like with a DLP projector. An LCoS projectors resolution will typically be found in the SXGA class and greater. 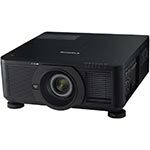 LCoS projectors typically have a higher resolution on average then DLP and LCD technologies. There is no "rainbow effect" with LCoS projectors like what you would find with a DLP. The "rainbow effect" is the result of the single chip and spinning color wheel. The contrast ratio of an LCoS projector is typically better than a Plasma TV. So far the lightest projector made with LCoS technology to date weighs 12 lbs. So these projectors are neither portable nor compact. DLP handles motion blur better than LCoS by making fast scenes appear sharper. 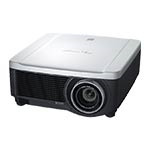 LCoS projectors are great for auditoriums, museums, medical education, and training fields.